Working with brides-to-be on a regular basis means we get asked a LOT of questions, and that’s ok, we like questions. A question that keeps popping up is What’s a common wedding reception format? So, we’ve decided to lay out a traditional wedding reception format for ya here. Though it is important to know that any part of this can be changed, added to, or taken away. Think of this more like a loose guideline of sorts. If you have any additional questions, feel free to leave them in the comments below. Enjoy! 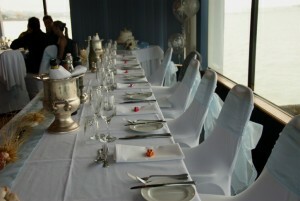 The arrival of guests to the reception site usually indicates the start of the wedding reception. If your ceremony and reception sites are in different locations, guests will be arriving at different times. Some guests may arrive early, while some will be trickling in for the next half hour or so, that really depends on how far away the two sites are. Of course, if your ceremony and reception sites are one in the same, guests will already be there and will be ready to start the festivities of the reception. Because you can’t control how early or late guests will arrive for the reception, it is important to let all vendors know when they’re responsible to be in proper attire and ready to go. At Mixing Maryland, we’ll arrive a few hours early and be prepped and ready to go at least an hour before it’s time to perform. You’ll also want to make sure that all tables and decorations are set up before guests arrive. This includes tables, chairs, food tables, photo booths, sign-in spots, guest books, linens, etc. This will ensure that everyone will be able to find their seats and will keep everything organized so the whole night goes smoothly. This introduction can include any of the following: bridesmaids, groomsmen, ushers, flower girl, ring bearer, special guests, parents of the bride and groom, etc. but almost always includes at least the bridesmaids, groomsmen, and parents of the bride and groom. Not necessarily in that order though, most commonly, the order would be the parents of the bride, parents of the groom, ushers with bridesmaids, flower girl and ring bearer, special guests, best man, maid/matron of honor, and finally the bride and groom. It’s important to give the bride and groom a proper entrance, because after all, the night is really all about them and the commitment they are making. That’s why the bride and groom are always introduced last. We’re pretty good and pronunciations, but it’s always best to go over the names of the wedding party with the wedding DJ (or master of ceremonies). The last thing you need is a MC who pronounces everyone’s names wrong and stumbles through the intros. Now that the introduction of the wedding party is out of the way, it’s time to gather the guests for dinner, hors d’oeuvres, drinks and finger foods, or whatever you’ve planned for the meal. Most traditionally dinner is opened up with a blessing of some sorts, whether religious or just a few words to thank everyone for coming and to enjoy the food. It’s pretty common to have the bride and groom start the food line. After that, guests can be invited to hit the food line at will or can be called up by table to keep things a little more organized. Oh, and if you’re the bride or groom, don’t forget to eat; most likely your day has gone by pretty quick with out much time to eat, maybe you’ve been nervous or been stressed, but now that the hard part is over, make sure you get some food so you’ll have energy to enjoy the rest of the night. And don’t worry, we’ll help organize this part as well. Whether you want to release people table by table, or you want an all out rush to the food line, we’ll do all the organizing and announcements for ya. 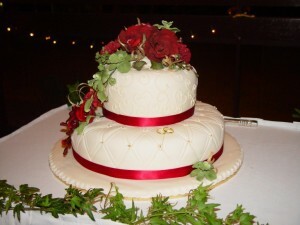 Now, you may be wondering whether or not to smash the cake into your new spouse’s face or to gently place a bite in their mouths, but whichever you choose, the cake cutting is a pretty traditional part of a wedding reception. Though the tradition goes as far back as the Roman Empire, these days the cutting of the cake symbolizes the sharing of one’s like with another. This is also a good time to get photos, your photographer will most likely be standing by grabbing shots, and your family and friends will be gathered around waiting to see if it’s gonna turn into a food fight or not. At most weddings it is customary for the best man and maid of honor to give a toast or a speech during the reception. Now would be a great time to do it. These days, however, it’s not only the best man and maid of honor who give toasts, sometimes other friends, parents, or special guests will chime in with some words of wisdom as well. I’ve given toasts at a few different weddings and while it’s a little nerve-racking, it’s a great experience to send a great friend into a marriage with some words of wisdom (but mostly bashing the groom and complimenting the bride). If you’ve been to a wedding, you’ll know that the first dance is an important part of any wedding reception. It’s the first dance a bride and groom will have as husband and wife. Some couples opt for a funny or upbeat song while some keep it sentimental, but no matter what you choose, everyone will be watching as the bride and groom’s first dance is one of the major spectacles of the evening. The Father/Daughter dance is another staple of traditional weddings. It’s beautiful and symbolic of a Father willing his daughter away to be married. In cases where the father of the bride isn’t able to be present, or there are more than one father figure in the bride’s life, substitutions and shared dances can be made. Another popular and traditional dance is the Mother/Son dance which is no doubt between the groom and his mother. Next up is usually the bouquet toss followed by the garter toss. For the bouquet toss, the DJ/MC (Mixing Maryland) will gather all the single women in attendance on the dance floor and instruct the bride when to toss it over her shoulder. Then the groom will do the same after removing the garter from the bride’s leg. 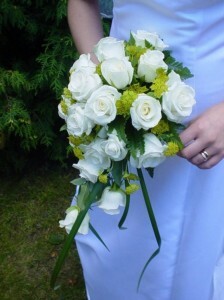 Tradition has it that whomever catches the bouquet and the garter and the next two to marry. 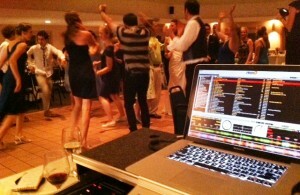 Here’s where choosing the right DJ to perform at your wedding comes into play. After all, you’re not just paying for someone to push buttons and spin records, you want someone that can read a crowd, get everyone dancing and keep the energy levels up throughout the night, and that is where we come in. With a legal music library of over 50,000 songs, professional attitude, and quality service (with no cheese), we’ll keep the party going all night whether you want an all-out party or just want to have a fun but relaxing reception. And there you have it, the basic traditional wedding reception format. Remember that because every wedding is unique, this formula is often changed around, added to, and in some cases thrown out the window. Whatever you’re looking to do, make sure you contact us to discuss your plans for the wedding reception you’ve always wanted.